Cook the potatoes in salted, boiling water until soft and drain, leaving to steam dry while. Cook the spinach for one minute in a hot pan until wilted then squeeze out the excess water. 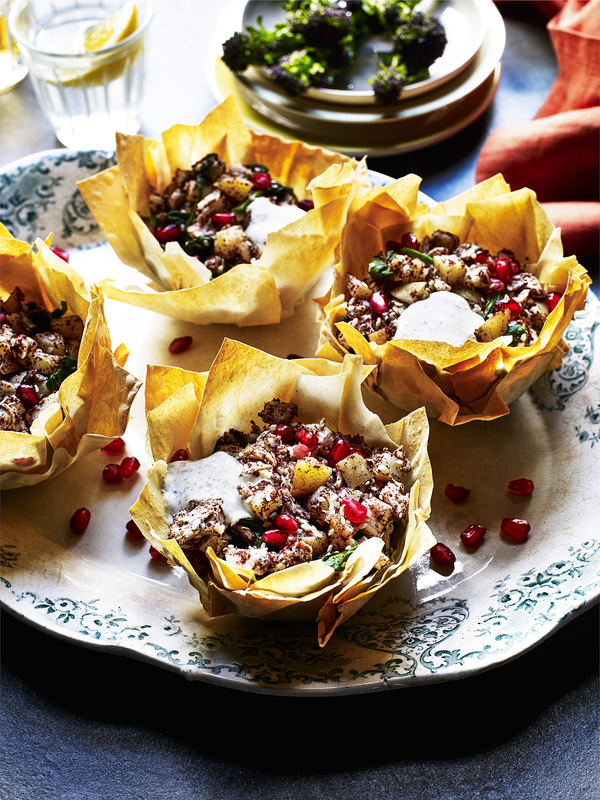 Mix together the remaining ingredients apart from the filo, pomegranate and butter. Taste the filling and adjust the seasoning. Wrap a sheet of filo over the bottom of a dariole mould/oven-proof teacup or muffin tray, spray with a little cooking spray and then wrap another one over it. Spray again. Repeat another three times then put in the oven until golden brown and crisp, about 10-15 minutes. When cooked and cool enough to handle, gently turn them upside down and remove the moulds. Fill with the cooked chicken mixture, top with pomegranate seeds and sesame seeds. Serve with the yoghurt and zatar mixture. Flavoured with traditional cumin and pomegranate, enjoy this aromatic Iranian lamb & potato one pot - perfect for an exciting mid-week meal. The perfect pairing, try these lamb steaks with a warm potato salad. Perfect for all seasons. Embrace the winter season with this warming traybake. Featuring a beautiful combination of potatoes, duck and shallots, this recipe is great for a cosy night in with friends and family.